We did it! Our first, er, second cooking class (thanks Paul) seems to have been a success. With a sold out group of eight people, mostly friends of our friend and principal marketer Kathleen (thanks! ), we were measuring, stirring, kneading, baking, and eating our way through some basic baking techniques. We worked our way through a no-knead bread, a quick flat bread, pizza, and soda bread, while at the same time discussing the differences in yeasts: wild, cake, active, and instant; and flours: hi-gluten, all-purpose, cake, whole wheat, and more; and discussing the proper way to measure flour if you don’t happen to have a scale to weigh it. In the two-hour class, which happened to run overtime (sorry), we did it all. Now the real test of success will be determined by how everyone’s bread turns out today. To all of our new friends, once you have baked your loaf of bread and your pizza, please take a picture and post it to our facebook page. We can’t wait to see how they worked for you. And for those traveling today, let us know if the dough survived a couple days in the fridge or freezer. 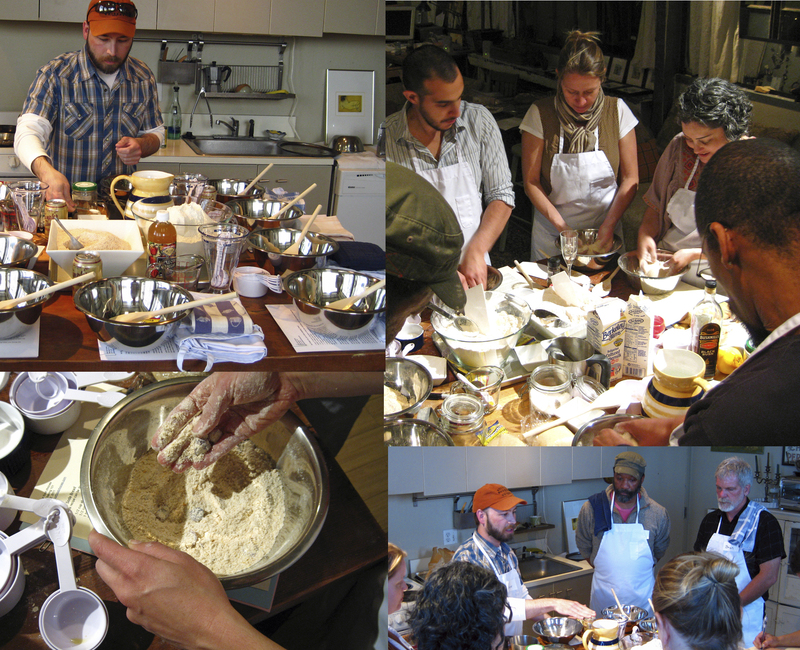 We’ll be teaching the Bread Baking 101 hands-on demonstration again on Tuesday, May 10 and again on Tuesday, May 24, at Velcrow Studio (or is it Salon, Zannah? ), from 6:30 – 9:00 pm. Thank you for a wonderful night! very cool…the bread and the team both look great!